The Fourth Industrial Revolution has arrived and is spreading at warp speed. Technology today plays a vital role in promoting global prosperity, but the pace and scope of innovation also creates uncertainty, expressed by some as “disruptive technology.” These are technologies that either purposefully displace existing products or that introduce ground-breaking ways of doing business, creating a new industry or turning an established one on its head. As we have seen over 14 years of the Excellence in Risk Management project, leadership in most organizations increasingly relies on risk management professionals’ insights. Today, that means that risk executives have both a responsibility and an opportunity to better educate themselves about technological innovations, which are reshaping their businesses and industries. 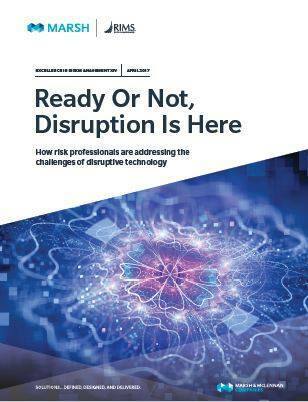 For the 2017 Excellence report, in partnership with the Risk & Insurance Management Society (RIMS), we conducted focus groups with risk executives in a variety of industries and surveyed another 700 of your peers to understand how the risks of disruptive technologies are being addressed. We hope you find this report a useful tool to stimulate discussions in your organization and with your peers. And we encourage you to reach out to us with any questions or comments you may have.